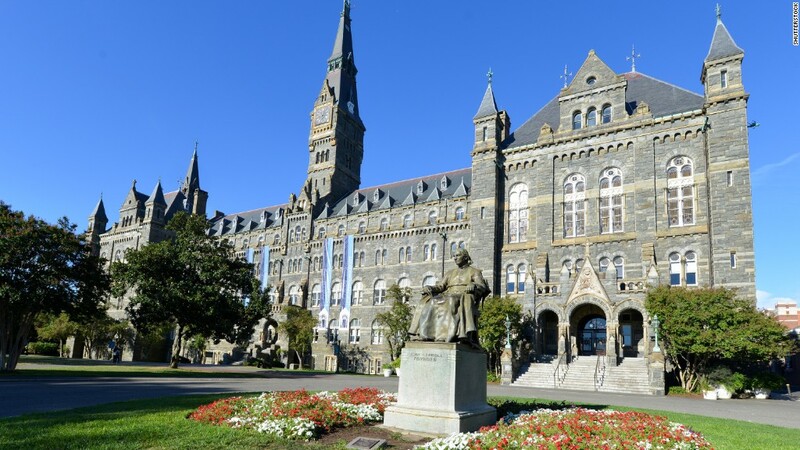 In an effort to acknowledge its ties to slavery, Georgetown University will offer the descendants of nearly 300 slaves preferential treatment in its admissions process. In 1838, the school sold 272 slaves who were working on plantations in southern Maryland to pay down its debts. Now, the school said it will give the descendants of those slaves "the same consideration we give members of the Georgetown community" when they apply. That means that the applicants will "receive an extra look" and that their relationship to the university will be considered. Georgetown President John DeGioia officially recognized the school's past Thursday afternoon in a press conference. "We must acknowledge that Georgetown participated in the institution of slavery. There were slaves here on the hilltop until emancipation in 1862." Georgetown will also have a Mass of Reconciliation where it will apologize for its history. "We cannot do our best work if we refuse to take ownership of such a critical part of our history," DeGioia said at the press conference. Last September, DeGioia created a 16-member Working Group of Slavery, Memory, and Reconciliation consisting of students, staff and alumni to make recommendations on how the school can amend its historical ties to slavery. To help find and connect with the descendants, the group created The Georgetown Slavery Archive, which provides genealogical information and other materials about slavery at the university. It also has documents that show the names, ages and relationships of the 272 slaves sold in 1838. Some descendants have reached out to the school and have provided additional information, according to Adam Rothman, a history professor at Georgetown who is also a member of the working group. A group of descendants who attended the press conference, addressed DeGioia and asked the school to seek more of their input as it moves forward on how to rectify its past. DeGioia has visited with descendants in recent months, and said that the school will support reconnecting the descendants of the slaves who were split up when they were sold. "We have very good records in our archives, more than 100 boxes," he said. Maxine Crump, whose great, great grandfather was among those sold in 1838, told CNN's Brooke Baldwin that she was overcome when she heard about the news. "I was driving at the time, and I felt like my car was going but I had stopped. It just took over my whole being. It was a door that opened that I never expected would have opened in my life. Along with the admissions treatment, the school will create a memorial to honor the 272 enslaved men, women and children, create the Institute of Slavery and its Legacy, and also rename two buildings that had been named after the presidents who facilitated the 1838 sale. Georgetown has a complicated and steep history with slavery, Rothman explained. "It was part of this broader Jesuit religious economy, which was connected by plantations manned by slaves in Maryland. It was a pretty complicated network Georgetown was part of." Slavery ties are prevalent in many higher education institutions. "Before the American Revolution, there were nine colleges established in the British Colonies, and all of them have direct ties to slavery and slave trade," said Craig Steven Wilder, a history professor at MIT. He added that all of the Ivy League Schools, with the exception of Cornell, also have ties to the slave trade. Other schools have also taken steps to rectify their past ties with slave labor. In 2003, Brown University launched a three-year study of its relationship to the trans-Atlantic slave trade. In response to the study's findings, the school created an on-campus Slavery Memorial that recognizes the schools link to the slave trade. Having Georgetown acknowledge its history is important to the school's community, Rothman said. "It's a diverse community, there are a lot of African American students, staff and faculty, and to have African Americans contributions to the history of the university recognized ... it's really important for bringing the whole university together."